With so many things effecting our native wildlife, from climate change and increased storm events, to introduced ground predators and overfishing, to pollution and politics, there has never been a more important time to protect and monitor our wild birds. 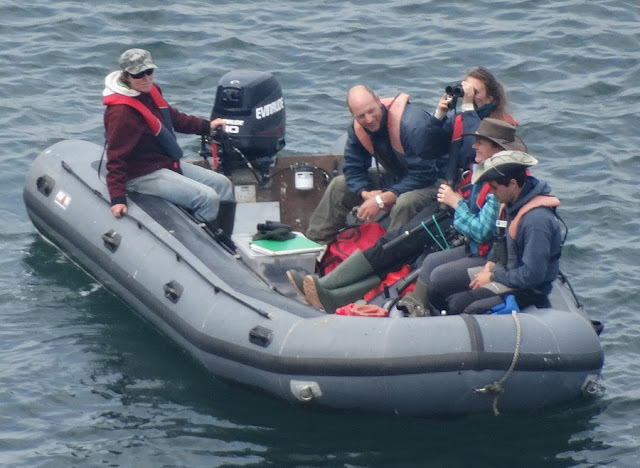 We have just finished the bulk of our seabird monitoring work on Skomer for this year and are ready to announce some of the initial results. 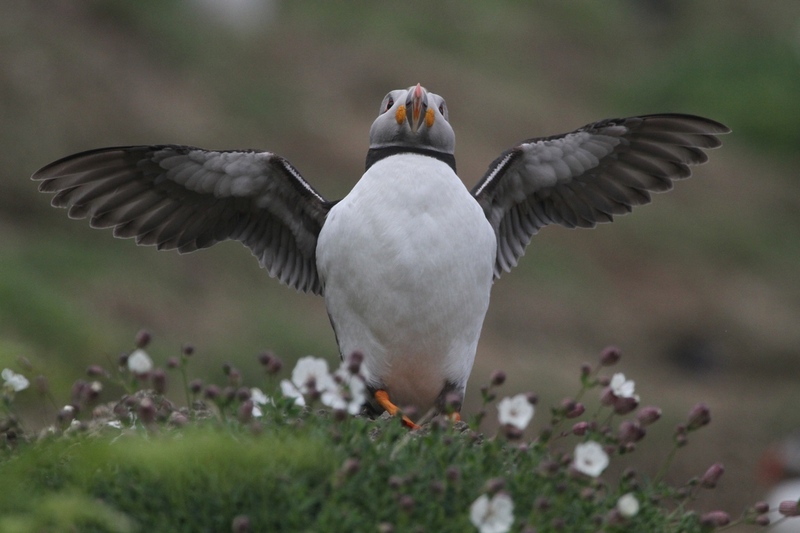 Now before you read on don't be alarmed by the above, things on Skomer aren't that gloomy. Obviously there are some ups and downs but generally speaking Skomer is a very special safe haven for a mind boggling number of seabirds. Huge numbers of birds to count, at Bull Hole. The counts have only just been completed so the totals may be subject to change after checking etc. but they give an idea of the state of things so far. The productivity and survival studies also take longer to report on. Eventually (usually at the end of the year), all of the results will become available in a full report on seabird monitoring on Skomer Island in 2016 and can be found on the Trusts website along with previous years reports. So to run through things; Puffin numbers are up from 21,349 in 2015 to a whopping 22,539 this year, an increase of around 6%. In light of worrying declines elsewhere this is an encouraging trend. 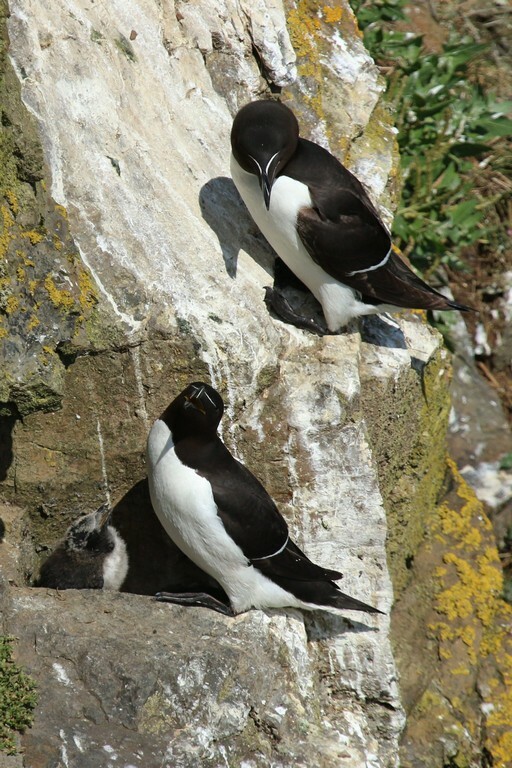 Razorbills counts were a complicated matter. The first count, at the start of June, was down by over 1,500 individuals, but by the time of the second count numbers had increased and surpassed the peak count from 2015, leaving us with an average of 7,250 (3.19% less than 2015). 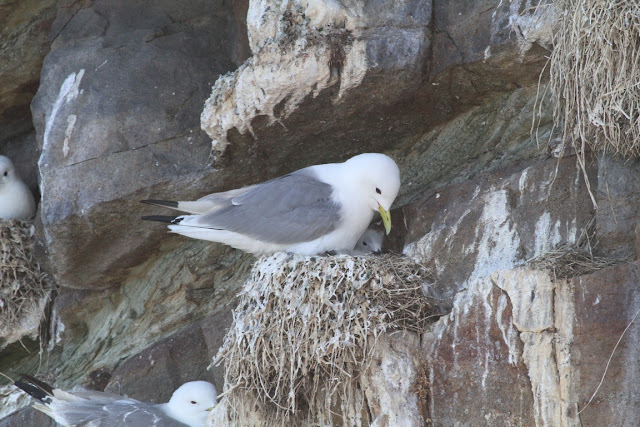 The diminutive Kittiwake is another species that has suffered declines around the country. After several years of decline on Skomer, the last two (2014 and 2015) had shown signs of recovery. This years count of 1,477 is however a drop of 4.5% on the previous one and leaves cause for concern. 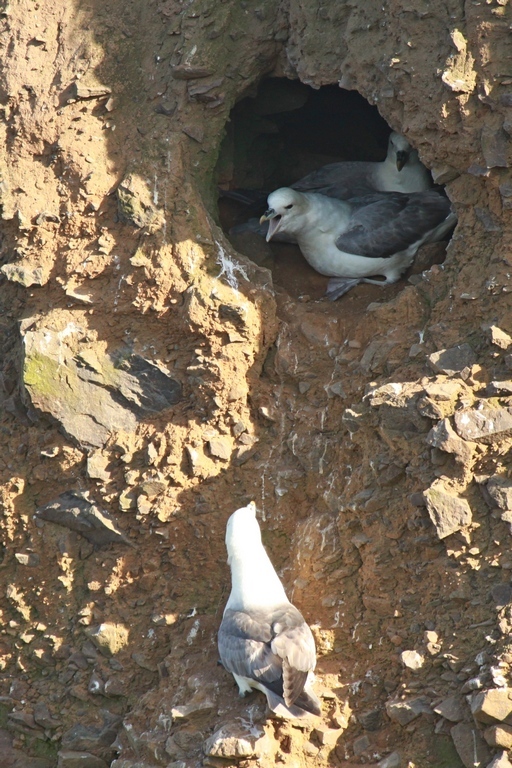 The Fulmar is doing well on Skomer. The population is at it's highest level since 2005 and is up by 15% on the previous year. Nest sites are well scattered around the island with concentrations on the Neck, the Wick and the cliffs between the Garland Stone and North Haven. This years count was 674 Apparently Occupied Sites. This is just a small selection of the seabird species we have on Skomer. If you visit at this time of year you may also see Cormorants (with large chicks) on the Mew Stone, Shags, Lesser black-backed, Herring and Great Black-backed Gulls (all with chicks) and Guillemots in their thousands. The most abundant species by far however is the Manx Shearwater and, although you won't see them, they are hatching in their tens of thousands in their underground burrows. 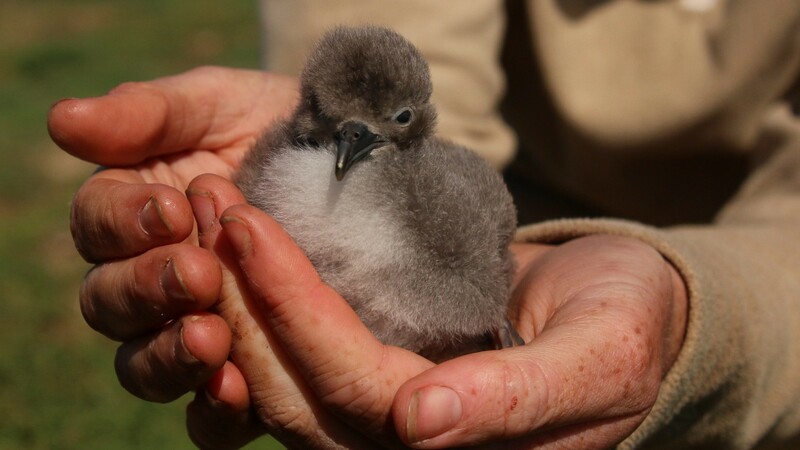 The Manx Shearwater chicks will not be ready to fledge until August, September or even October. This is the wonderful thing about Skomer; no matter what time of year you visit there is always something absolutely amazing to see. Long-term Volunteers from Australia - a new irruption species? 1. breaking or bursting in; a violent incursion or invasion. 2. a sudden increase in an animal population. Hi, I’m Tracey-Ann and I’m the seabird monitoring volunteer on Skomer this summer. The role is a new one this year to help with the huge amount of monitoring work that goes on on the island during the peak seabird breeding time. I’m here for five weeks in total and the time is absolutely flying by, like a Puffin in a very strong crosswind (this is happening outside the window just now – who’d have thought that Puffins could go sideways so fast!) It’s such a fantastic privilege and a pleasure to work on Skomer, to join the amazing team of people here at the moment and, in an albeit extremely tiny way, to contribute to the long history of research and monitoring that Skomer is renowned for. Summer is a busy time for Skomer’s seabirds and everyone who studies them. This Lesser Black-backed Gull was counted during the gull survey in May. Photo T-A Hooley. I’ve come to Skomer from Melbourne (there’s a minor invasion of Australians here this year). I’m a biologist and have been hooked on seabird ecology and conservation since first meeting a Shy Albatross while sailing on a Tall Ship in Tasmania about eight years ago. I now crew Tall Ships as often as I can and I love the opportunity it provides for spending vast amounts of time in the seabirds’ realm, far out in the ocean and in every kind of weather. Watching albatrosses in flight in 40 knots of wind is absolutely breathtaking (and it’s why I’m enjoying the Fulmars here on Skomer so much – they fly in quite a similar way.) Back on land, my day job is at Melbourne Museum where I coordinate biodiversity surveys. We get into quite remote places where little or no survey work has been done yet. It’s such a contrast to Skomer with it’s impressively high intensity of monitoring and its robust data sets stretching back to the 1940’s. We’d love to have more data sets like these back home! One of Skomer’s Northern Fulmars in flight at North Haven. Photo T-A Hooley. This week on the island we’ve been busy finishing off the shearwater census. We somehow seem to have saved the most burrowy plots til last and so we’re working extremely carefully in the sites, crawling on hands and knees to check each burrow for a response to the playback of the shearwater call. After listening to the tape day in day out for the last couple of weeks, we’ve all managed to perfect out Manx Shearwater ‘impersonation’ – no doubt this will come in handy in a bar somewhere one day! Jane, Elisa, Bee and Andy doing their cover version of ‘Manx Shearwater, Greatest Hits’. Photo T-A Hooley. And now we’re getting underway with the second round of the Whole Island Seabird Count. Every year, each cliff-nesting bird on the island is counted – twice! This means all the Common Guillemots, Razorbills, Black-legged Kittiwakes and Northern Fulmars (though this year our job has been made a little easier as we’re not required to count the Guillemots.) Doing the whole island count twice and then taking an average helps improve the reliability of the data. The results of the counts are plotted with data from all the preceding years to help identify trends in populations – are some species increasing or decreasing over time? If so, we can start to investigate why and potentially address any relevant conservation issues. Razorbills – ‘2’, Puffins – ‘2’, Guillemots – ‘um, 1.75…’ Luckily we don’t have to include the Guillies in the Whole Island Count this year. Photo T-A Hooley. 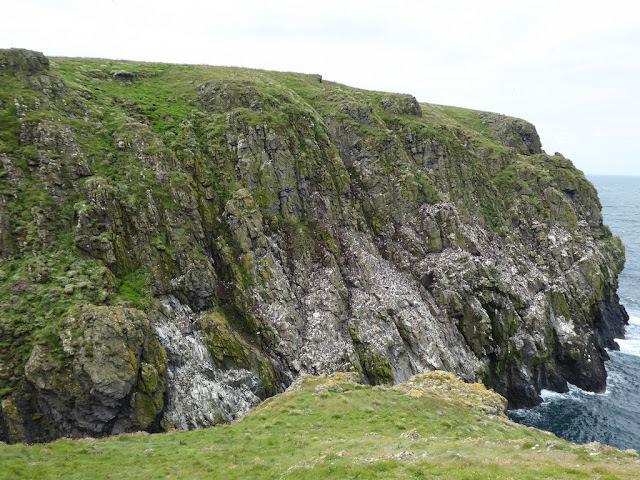 Old and new photos of the cliff sections of Skomer. 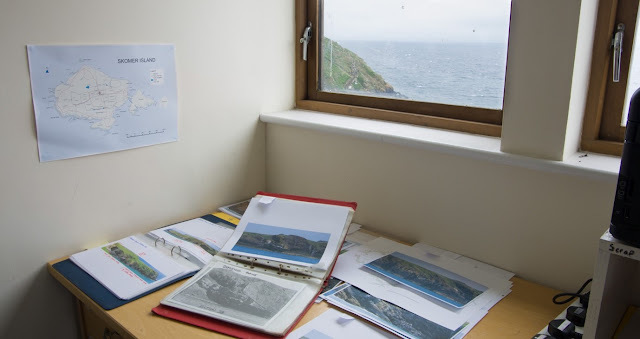 And the office window at North haven where the puffins go whizzing by… Photo T-A Hooley. We do most of the cliff counts from the RIB (rigid inflatable boat), and a few from land where there are suitable vantage points. Being out on the boat is one of the best bits of the Skomer fieldwork. We’re out each day that the wind is Force 4 or less and we do the counts from 10 am – 4 pm. This usually includes a little bit of time for a lunch break in the boat, often in a beautiful sheltered cove with seabirds swimming around us. Guillemots sneaking up on us on the RIB. They’re extremely curious and come very close to the boat, but whenever we turn around to look at them they swim away in a very nonchalant manner as if they weren’t really checking us out at all! Photo T-A Hooley. Today we’re also having a team meeting to plan the Storm-petrel surveys. We’ll be starting these in the next day or so and doing them most evenings after the boat counts, so it looks like the next couple of weeks on the island are going to be well and truly action-packed! I’m really looking forward to it, though I hope it doesn’t make the time going zooming by even more quickly. Skomer is a truly amazing place and it’s going to be hard to leave.